iPhone and Android apps for this popular pizza chain which reaches over 100,000 users (on average) per day. I joined Future Platforms to oversee and lead the end-to-end design process of the Dominos apps for both iOS and Android platforms. We essentially worked like an in-house product team, releasing quickly and efficiently. Over the space of 13 months we released over 22 new updates and I personally led the design for over 61 new iPhone and Android features. The following 9 improvements were some of my favourites to work on. Through remote testing we changed how users are presented and select different methods of payment. We moved away from displaying options in a picker to a glanceable list which stays pre-selected once they make a payment, and also displays reasons as to why a particular method is not available. Old vs new payment method designs. Our new approach proved the better and quicker option in completing a payment journey. Users completed a payment 69% quicker using variation B* on average. *Where variation B is the new design. 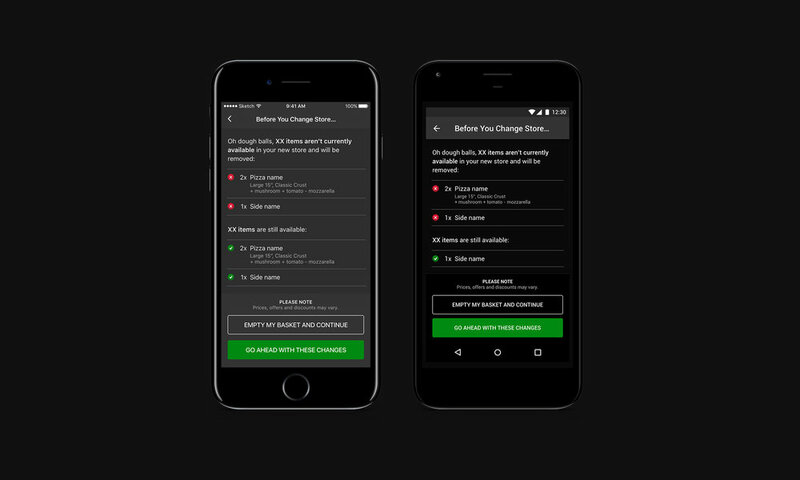 The store selection process was completely overhauled to give users the choice to find a nearby one to collect from. We also took the opportunity to display more detailed information, for example if a store wasn't accepting delivery orders, was about to close, and todays opening times. The entire store finding journey was rethought to give users choice when selecting a store to order from. We updated the look and feel of the Meal Deal Builder to something more visually engaging, with the aim to give the user a clear view of the components of a deal and to entice them to create and order. As this was a key feature of the apps, used by a high percentage of customers, we performed a remote test to gauge usability reactions to the new design. Old vs new Meal Deal Builder designs. "I think that the layout is extremely easy to use compared to really big brands [...] I ll name a few, Domino's for example, I just feel that this compared to that is extremely easy - seeing the pictures really helped [...] I really like the ease for the customer"
All participants found the new Meal Deal structure clear and intuitive. Some Meal Deals were only released to customers within a certain time period. However there was nowhere which stated when the deal would actually finish. 3% of customers fell within a 10 minute window where a deal they purchased was about to expire so were at higher risk of not converting because a deal expired without them knowing. To help combat this potential issue we used Optimizely to create a variant test where 50% of users were shown a timer when they hit the final 10 minutes of a deal, and the remaining 50% were shown no changes. Through analytics we discovered that 1.3% of customers decided to switch to a different store while having items in their basket. Logic in the app didn't cater for basket contents to be moved between stores so if a user decided to switch they were alerted that they would lose their basket contents which is a notable pain point. We knew that this was a piece of functionality which was to be expected by any user and should happen automatically. So we designed an MVP solution where if a user decides to switch to a different store we would automatically migrate the basket over as well, with scenarios to review automatic changes to the basket contents if the new store didn't stock certain products. A flow of how migrating baskets should work in general. An intermediary screen which asks the user to review their basket contents if some items are not available in the new store. One important feature we released was adding Google Pay as an option for Android users, bringing that platform in line with iOS which already had Apple Pay integrated. Various Google Pay screens from on-boarding through to payment. With the announcement of the iPhone X we reviewed the app in-depth to document, fix and release any breaks in layout and general improvements to make it look as best as it can do on these devices. Phase 2 of our iPhone X updates specifically for the Deals section. An example of a captured improvement where we made use of the extra space to extend imagery. We redesigned the confirmation screen to display more informative data which the original confirmation screen was lacking and also aimed to make a more visual and interesting scrolling experience through the use of parallax. New and improved Order Confirmation screen. An on-going exercise, we continuously kept reviewing the app in-depth to make sure that VoiceOver accessibility was properly catered for. Working with the UX team we created an app map and highlighted pain point areas where customers using VoiceOver were struggling to proceed or even hit dead ends. Screens with notable pain points were reviewed and then were marked up with a preferred VoiceOver pattern. The studio pride themselves on their research led approach to projects so I also assisted in planning and implementing an improved process for defining new app features, primarily through remote testing. Working with a lead strategist and other key members of the design team we gathered data through a combination of analysing analytics and reviewing app store feedback to identify issues and highlight areas for improvement. Once these insights were gathered, we worked with Domino's to design and prototype solutions which were then remotely tested with real users using WhatUsersDo to help validate more complex design problems. As we were releasing iteratively and not producing large UI overhauls all the time, we had to make sure that the design team were designing consistently when exploring new features. Taking inspiration from Spotify's GLUE process myself and other colleagues defined a process for building 'one source of truth', which consisted of master Sketch files for each platform, separate Sketch libraries for symbols and text styles, and finally Abstract to version control all of these together. When we released a new update we would get together and update our master files and libraries, and finally committing them to Abstract.